All the styles listed in Table 17 are real-world martial arts. Aikijutsu: This Japanese style dates back several centuries; it is one of the foundations of modern aikido. Though it includes more aggressive blows and techniques than aikido, it is still more a defensive than offensive style, principally concerned with throws and evasion. In some schools, sword and staff techniques are taught. Atemi: This art was derived from the much older Chinese ch'uan-fa arts by the warrior caste of Japan. A technique for attacking vital points of the opponent, its usefulness faded as the Japanese sword arts developed. To the modern martial arts student, "atemi" is a generic term for certain types of blows. Jujutsu: This art was systemized from earlier fighting styles in the sixteenth century. Though the modern form, judo, is principally thought of as a wrestling art, older jujutsu forms included more strikes, chokes, and even weapon techniques. It was a fall-back art for the warrior temporarily separated from his principal weapons. Karate: This style, under the name of te ("hand"), was developed in Okinawa over a period of many centuries. This process was accelerated after the 17th-century conquest of Okinawa by Japan and subsequent laws banning weapons and martial arts. Te's development incorporated use of ordinary farming implements, such as the threshing nunchaku and scythelike kama, which were not banned. Karate ("empty hand") was not popularized in Japan until the 20th century, but it is not too much of a stretch to assume that a Japan-like fantasy culture will have a style like karate. Kung fu: Systemized study of the fighting arts dates back into the mists of history in China, but legend attributes much of the origin of Chinese martial arts to Bodhidharma, a Buddhist monk from India. In the sixth century of the common era, it is said, he came to Shao-lin temple in China and taught his Indian style of boxing, which became the basis for many of the kung fu styles. Ninjutsu: The martial art style of the ninja developed gradually in parallel to the ninja's espionage art. It is a deceptive style with hard and soft elements, a style in which it is as important to be able to throw down an opponent and run away as it is to damage him. A character proficient in Style Analysis can make a nonweapon proficiency check to determine that a ninja is using ninjutsu. It is therefore useful for a practitioner of ninjutsu also to know some other style, such as karate, at least at a basic level. That way, if forced into unarmed combat when in the presence of friends who are not ninja, the ninja character is less likely to give himself away. Sumo: One of the most ancient forms of Japanese combat, sumo wrestling's origins vanish into Japanese mythology. Legend attributes the first sumo match to a fight between a mortal hero and a demigod. A more historical account describes a type of sumo match taking place in the first century of the common era. Though the goal of modern sumo calls for the opponents to try to push one another out of a ring, older forms included hand strikes, kicks, and head butts. The modern form still includes a painful and distracting slapping technique. Tae Kwon Do: This Korean martial art was originally derived from Chinese techniques and systemized in the seventh century of the modern era. It is a hard style, emphasizing punching and kicking. 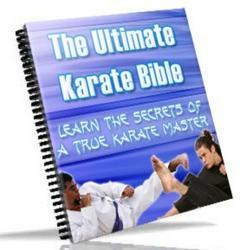 Naturally, it is a gross oversimplification to lump all styles of kung fu, or karate, or most of the other styles described here under one set of maneuvers. A DM who knows enough about a martial arts style to object to the way it has been presented here is free to develop his own set of guidelines for it, using the rules presented next.